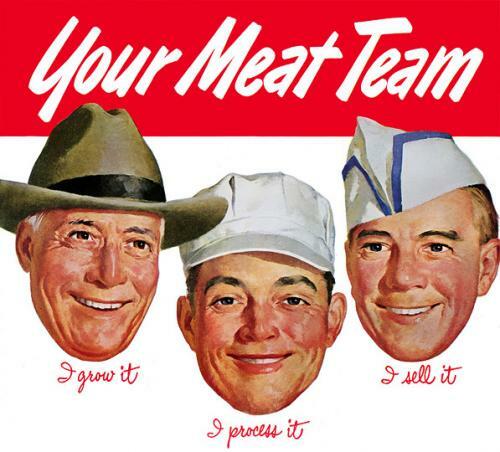 Your meat team.I grow it. I Process it. I sell it. The Prostitue, The John, The Pimp? Where’s the guy that removes their conscience? Wwhy does all their faces are so red? Somebody had a little more slips of whisky. warren you are one funny sumbitch. I’ll be here all week. Try the veal. I was going to make the obligatory reference to beating meat, but alas, Warren has beat me to it. Maybe its not meat they are growing processing and selling- they all look stoned. how does one -grow- meat? i am suspicious.